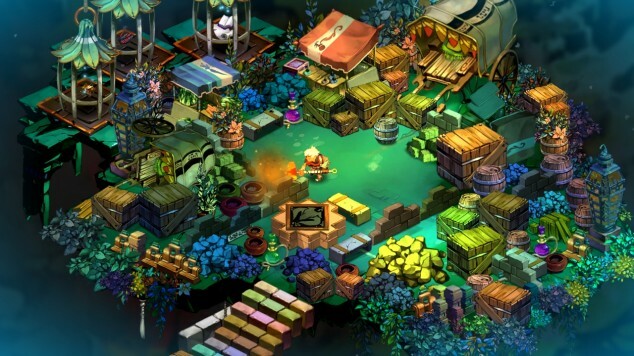 Bastion is an action RPG released on multiple platforms including the Apple iPad that features a unique voiceover narration and lush colourful world. 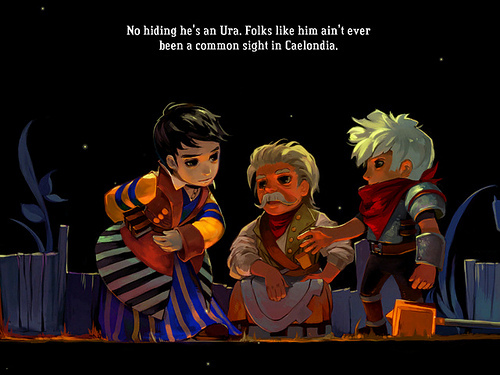 The thing that sets Bastion apart from most games is the entire experienced is narrated by a grizzly voiceover that adds personality and charm. The innovative narrator not only tells the story as you progress but also comments and describes your every action. If you go off the path to smash some of scenery with your hammer the narrator will make it seem like it is part of story. The voiceover is dynamic, so you don’t hear the same lines ever repeat, giving the impression of an omnipresent person following you throughout your adventure. Coupled with the narration is a 2D world that is vibrant and mesmerising as it expands at your every step. 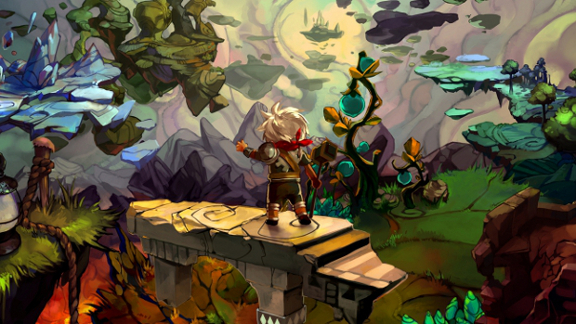 The art style is imaginative and evokes a fairytale like quality that is instantly inviting. The story follows a silent hero known as The Kid, as he works to restore the Bastion after the land is destroyed by an apocalyptic Calamity. He must re-discover the world as it is now broken into floating pieces of land and search for survivors amidst the destruction. The narrator is a stranger The Kid meets and together they reclaim Cores to power the Bastion. The story is simple yet holds a few twists and the narration layers on character development at a brisk pace. It is fun discovering new locations to see the beautiful environments as well hear about what they were like before the Calamity. The game play is combat heavy as you will have an arsenal of weapons at your disposal. You can take two weapons on each mission including a giant hammer, machete, pistols, muskets and bows as well as a special attack and shield. Dodging and rolling around the forests, swaps and cites while disposing of many different types of foes feels great and variety in weaponry allows you to play in many different styles. As you progress you also get access to upgrading weapons, equipping stat boosts and bonuses and even the ability to enhance enemies in return for more experience points. This simple looking game hides an extra-ordination level of depth. Bringing the game together is the atmospheric soundtrack. The music could be forgiven for just being the background to layer the narration over, but it does much more than that. Featuring instruments such as electric guitar, harmonica, harps and drums the compositions are fantastic and mysterious. Some highlights include the moody vocal theme “Build That Wall” and the blues piece “Spike in a Rail”. A lot of the compositions are things you would not normally hear in other RPGs, but they fit well in Bastion’s fantasy world. 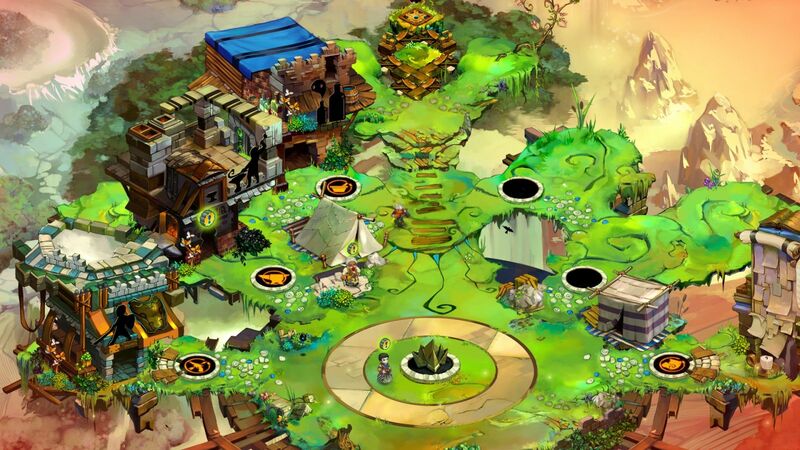 Bation is an innovative and creative RPG with great level and artistic design and character. 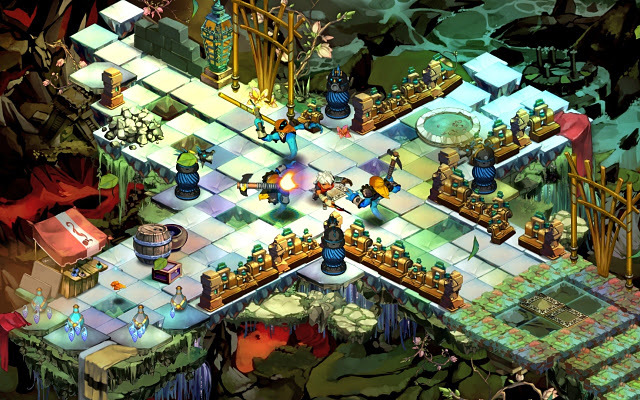 If you wish to play an RPG presents its world a little differently to most, then you should play Bastion.